I have to admit that I didn’t really appreciate pumpkin. The only time I had had pumpkin before was in a pumpkin soup cooked by my friend. I had never cooked anything with pumpkin on my own before. It all changed this autumn when Polish food bloggers started cooking meals for the Pumpkin Festival. Looking at the pictures of all the delicious meals they had cooked, made me want to try pumpkin too. I’ve started with baked penne recipe from Ela’s blog. The recipe, which originally comes from the Italian magazine Cucina Italiana, called for Italian speck, but I made a vegetarian version of it - I omitted the speck, doubled the amount of broccoli, and increased the amount of pumpkin and cream. I have already made this penne twice and both times it came out fabulous!!!! It not only tasted delicious but also looked so beautiful. I just loved the mix of colors in it. I'll definitely make it again. Here’s my vegetarian version of the recipe, but if you want, you can add some speck or ham to it, just fry them with a little olive oil before. *To make pumpkin puree, preheat the oven to 180°C (350F). Cut the pumpkin in half and scrape out the seeds and threads. Place the pumpkin in the oven and roast until the pulp is soft. Remove the pulp from the rind with a spoon. With blender or food processor, blend the pulp until smooth. Bring a large pot of water to boil, salt it, cook the broccoli. Remove the broccoli, add penne to the same water and cook until al dente. Drain. Mix the pumpkin pulp with cream and 2 tbsp Parmesan. Season with salt and lots of pepper. 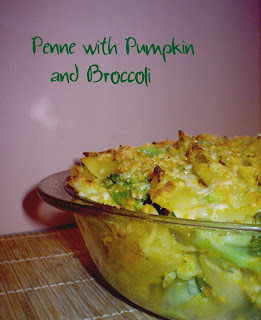 Toss the pasta with the pumpkin sauce and broccoli. Pour into a greased baking dish. Sprinkle with the remaining Parmesan and butter pieces. Bake for 20 minutes or until the top is golden and cheese melts. I'm glad you like it:-) Looks great.